Diane Williams fought for two years to stop Oakland Unified from spraying the likely carcinogenic herbicide. And, finally, she was vindicated. Diane Williams says she's still "madder than hell." 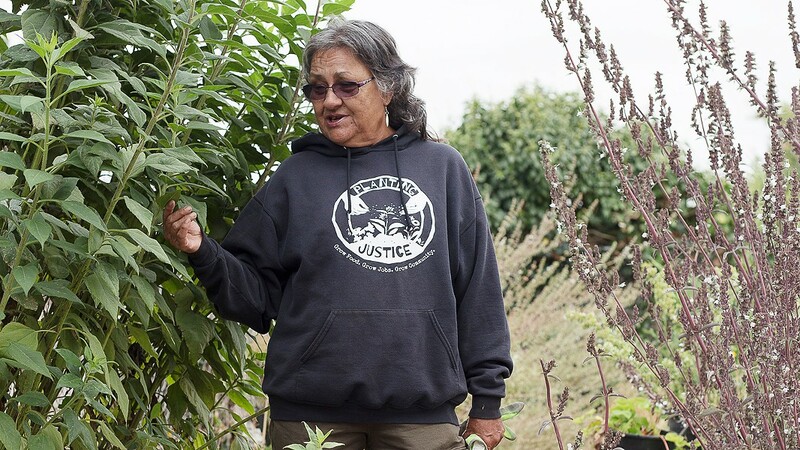 One day in June 2016, a gardener visited Oakland's Horace Mann Elementary School in West Oakland to inspect a plot of vegetables and herbs that she had been maintaining for six years. Suddenly, Diane Williams caught wind of something toxic. "Some of the plants were dead, and I couldn't figure it out," said Williams, who works with Planting Justice, a small farm and nursery in East Oakland. She said she could smell a chemical odor, too. Suspecting her garden had been poisoned, she called the Oakland Unified School District. Through that phone call and a subsequent meeting with the district's superintendent and several staff members, she had the explanation for her wilted plants: To control weeds, the school's groundskeepers were using Roundup, the signature product of Monsanto, now owned by Bayer. In a series of emails to the school district, Williams pleaded with officials to quit using the powerful herbicide. She reminded the school officials that Roundup has been closely linked by abundant research to declines of honeybees and other pollinators. She noted that some California school districts had already decided to stop spraying Roundup, and she named a few nations that had banned glyphosate, Roundup's key ingredient, which the World Health Organization had designated as probably carcinogenic. On June 22, Sorbor Twegbe, the school district's environmental health and safety manager, wrote Williams back: "I welcome a dialogue with any and all who are friendly, open minded and would like to put the interest of the [d]istrict's children first before their own agenda." Nonetheless, OUSD continued applying Roundup for two more years at dozens of schoolgrounds. At the same time, the city of Oakland and the Alameda County Department of Public Works were spraying public places with thousands of gallons of Roundup and other products containing glyphosate. In fact, Williams began an email dialogue with the county in 2017 in which she beat the same drum — asking that it consider aborting the use of Roundup. But no one at county public works acted on her request. Vindication eventually arrived for Williams. This summer, a lawsuit that rocked the world of chemical herbicides apparently sent local officials scrambling for cover. The very day that a San Francisco court ordered Monsanto to pay $300 million to cancer-stricken Dewayne Johnson, formerly a school groundskeeper who had been accidentally doused with Roundup, OUSD decided to immediately quit using the herbicide, according to an email that Twegbe sent on Aug. 15 to several colleagues, as well as Williams, her coworkers, and this reporter. The San Francisco court concluded that Monsanto knowingly marketed a possibly cancer-causing chemical. The city of Oakland formally halted its use of Roundup on Sept. 1, according to a notice from the Public Works department. The county is reviewing its practices. Though this was the outcome that Williams was hoping for, she said she is "madder than hell" that the school district ignored her pleas to cease use of the herbicide. "They could care less about those of us who might be vulnerable to the effects of Roundup," Williams said. "They know this pesticide causes cancer, and they've been using it freely in Oakland. This [decision to quit using Roundup] is only about risk management." OUSD officials did not respond to emails or phone calls for this report. According to herbicide reporting records, the school district used 42 gallons of Roundup Pro on dozens of school properties from 2015 through 2017 — generally in applications of a pint or two at a time. The school district's herbicide use is just a drop in the bucket, however, of the total amount of Roundup and other products containing glyphosate that East Bay public agencies have used in recent years. The Alameda County Department of Public Works applied 4,283 gallons of Roundup Custom and 4,061 gallons of Glyphosate 5.4 — another herbicide — to unwanted greenery between 2013 and 2018, according to public records. The city of Oakland used 225 2.5-gallon jugs of Roundup and Ranger Pro, another glyphosate herbicide made by Monsanto, between 2016 and 2018. John Medlock, Alameda County's deputy director of public works, said his agency is now conducting a review of its practices — a move that he said was initiated in June and had nothing to do with Johnson's lawsuit, which was still in court at the time. Medlock said his agency has for years used herbicides containing glyphosate mainly within its roughly 500 miles of flood control channels. These concrete-lined basins contain runoff during rainy periods but are dry much of the year and can become overgrown with weeds. Medlock said his agency sometimes mechanically trims weeds or uses goats to munch them back. The point is to prevent the small canals from clogging with vegetation. "We use [glyphosate] only when we absolutely have to," Medlock said. One of the concrete-lined creek channels that the county manages runs past the Planting Justice nursery, which prompted Williams' concern in the matter. She said she believes using glyphosate is never essential. "I'm a gardener — I deal with weeds every day," she said. "I bend at the waist and pull them out of the ground." Medlock said his agency only applies potentially dangerous herbicides following strict guidelines and best practices recommended by the manufacturer. Employees using the chemical often wear protective clothing, and the county posts warnings to alert residents and neighbors who might be affected, he said. But staffers at Planting Justice say they have never seen such a warning sign. Williams' coworker, Nnej Kennedy, said she has watched county officials deploying herbicides from their vehicles, but in two years of working at the garden, she has never seen a posted notice informing the public of the spraying. Margaret Reeves, an Oakland-based senior scientist with the Pesticide Action Network of North America, believes the probable hazards posed to human health by glyphosate should prompt agencies and individuals to immediately halt their use of Roundup until science proves the herbicide is not harmful to humans — the basic tenet of what scientists call "the precautionary principle." In an interview prior to the school district's announcement that it would cease using Roundup, she said the district was risking human lives for the sake of convenience. "If there was a horrible pest about to destroy a farmer's whole crop, and this was the only tool available to stop it, that would be one thing — but here, the threat is, what? Weeds?" she said. "How do you weigh that against the human health risk? They're applying a carcinogenic chemical out of cosmetic concerns." The World Health Organization classified glyphosate as probably carcinogenic in 2015, but the call was contested. Some alleged the organization excluded from its evaluation key research that would have found glyphosate to have no correlation with cancer. But the World Health Organization's International Agency for Research on Cancer responded that it excluded the information from its own assessment because Monsanto officials had meddled with the data and influenced the outcome of the research. Williams said she is disappointed with local environmental groups — and many national ones are based in the Bay Area — for failing to speak out more on this issue. "They should be stepping to the front lines to protest the use of a carcinogen on public property," she said. "Instead, we have a dying man at the vanguard of this." Hours after the verdict in the Dewayne Johnson case was announced, Williams emailed the school district and voiced both triumph and frustration. Correction: The original version of this report misstated the location of Planting Justice. It's in East Oakland, not West Oakland. Also, the story erroneously stated that Alameda County had ended its use of Roundup. It is reviewing its practices.